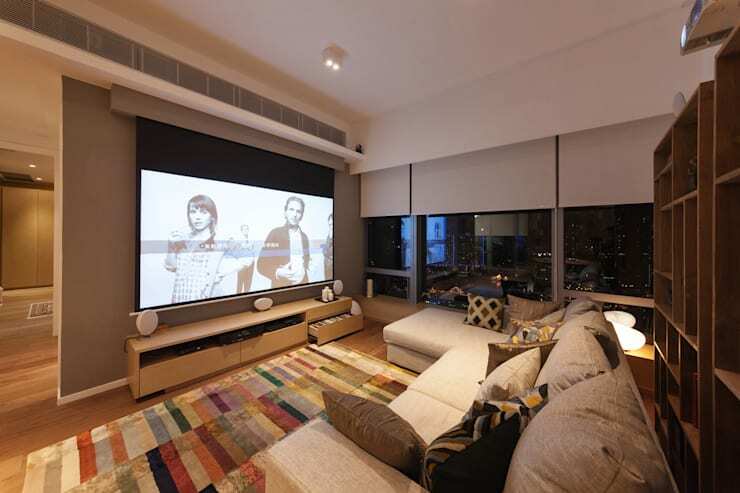 One of the challenges of high-rise living, particularly in a densely populated city like Hong Kong, is trying to pack myriad luxurious features into a small apartment space. This lovely abode, the brainchild of architects Arctitudesign, includes all the mod cons necessary for a comfortable lifestyle, within a humble 100m2 floorpan. 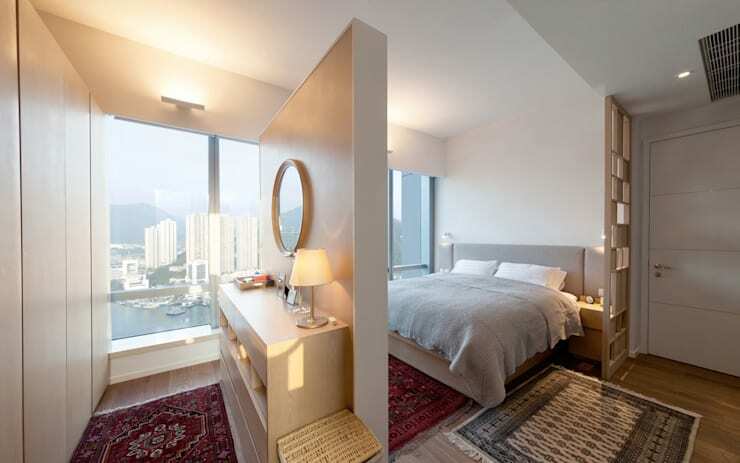 Design director Alexander Suen took great pains to ensure that 50% of the materials used are recycled or second hand, adding an element of sustainability to this urban construction, which exists in a prime position overlooking Hong Kong's beautiful harbour! The home exudes casual style, with the use of wood throughout the space imbuing a soothing sense of tradition, and a spectrum of deep colours included in the decor to subtly enliven the atmosphere. A gorgeous view of the surrounding city awaits onlookers, as the harbour streams through large windows, intriguing the home with its relaxed activity. The living and dining areas melt effortlessly into one another, while the office and master bedroom have been sectioned off for privacy. The office space appears mature but light-hearted—more like a playroom for grown-ups than a place to undertake painstaking tasks. The bedroom rests in relaxed luxury, with a voluminous bed looking over another spectacular view, and a sectioned dressing area taking this design to new and inventive heights! The master bedroom of the home is one that truly manages to capitalise on inventive design to create a spacious, luxurious atmosphere. The bedroom has been cleverly partitioned to accommodate sleeping and dressing spaces. A voluminous, grey bed echoes the slate of the living room sofa, inviting rest and relaxation in front of another stunning view. Just beyond the wood-fininshed partition a dressing area has been constructed, with a chic, circular mirror and simple storage cabinet lit by the warm glow of a lamp and overhead lighting. Upon entering the main living space of the apartment, the expanse and opennessis palpable, with the relaxed decoration and stunning view adding instant appeal. Polished wooden floors warm the abode with an air of homely tradition, as their wide panels add to the sense of expanse within the space. Wood proves a prevalent part of the decor of this design, having also been used to construct the dining setting, TV stand and bookshelves. An array of deep colours adds even more personality to the space, with the spectrum of the colourful rug and modern artwork enlivening the rooms. 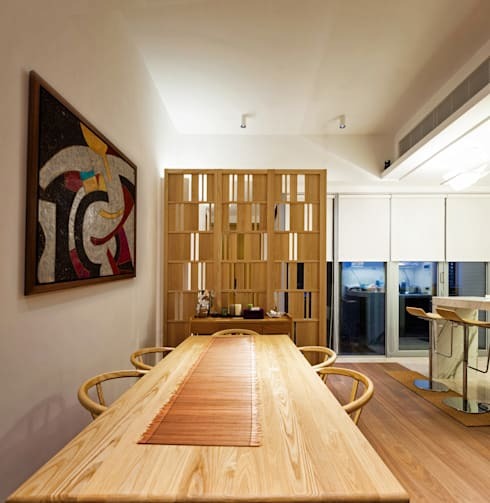 A close-up of the dining setting displays simple yet stylish furnishings, which tie into the pale hue of the timber screen sectioning the entrance of the home from the living space beyond. The sleek lines of the table run parallel to the streaming woodgrain of the polished floor, helping to visually elongate the rooms. To the far right we can see the beginnings of a contemporary kitchen, with a white, marble kitchen island and minimalist bar stools providing a secondary area for casual dining, or for interaction whilst whipping up a meal. A close-up of the living area portrays a relaxed and inviting atmosphere, with the deep tones of the colourful rug adding character within the space. The subdued grey of the sofa provides the perfect backdrop for a selection of patterned cushions, and the subtle geometry of the wooden bookshelves accommodates plenty of knick-knacks. 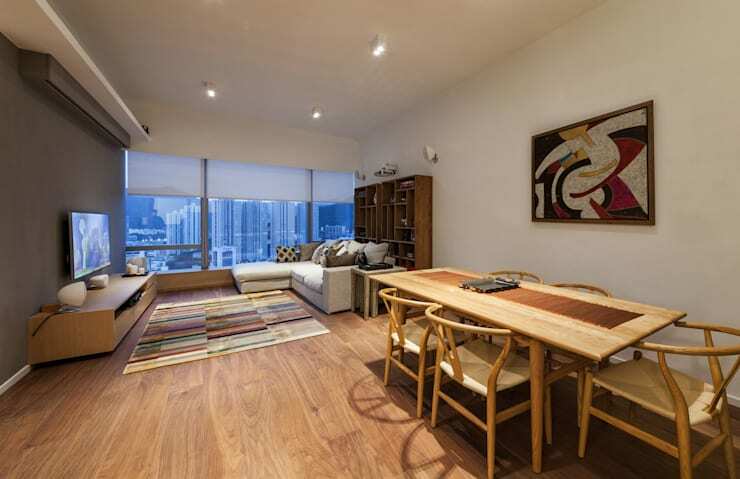 Two strong focal points exist in this room: the picturesque view of Hong Kong streaming through the windows, and the television opposite the sofa. After dark, when the view of the harbour has receded, the space can transform into a small, private cinema, as the blinds are lowered alongside a retractable screen, and films or games are beamed from a mounted projector. 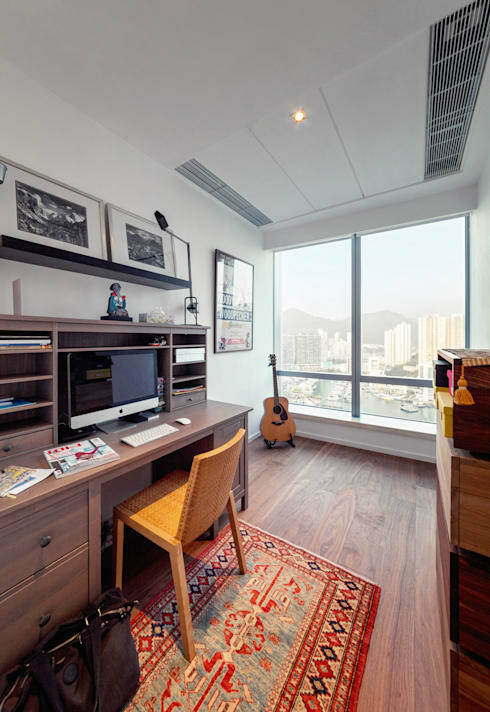 The office of the home appears more like a play room for grown-ups, with expansive windows and a stunning view of Hong Kong enhancing its relaxed atmosphere. The wooden decor in this room is darker and slightly more mature than the paler tones seen previously, with the floorboards and furnishings existing in a richer brown than those in the living and dining areas. Black and white photographs decorate the room, providing a sense of personality, while the vibrancy of the rug adds a splash of colour. A state of the art computer sits patiently on the desk, ready to accommodate both work and play, and an acoustic guitar rests in the corner, primed for musical inspiration. For more ideas and inspiration about inventive, high-rise living have a look at The Hong Kong apartment with a place for everything! Can you imagine living in an apartment like this? Has the decor given you any inspiration for your own home? Tell us your thoughts below!